Delhi Belgian Club is considered one of the most active halls in Southwestern Ontario. During the course of a winter's week, it is estimated that between 2,000 and 3,000 people are entertained there. Until this year most of the activity at the hall took place upstairs. However, with extensive alterations and additions of the basement officially opening this week, the lower section is attracting more and more crowds. Capacity at the men's and ladies' lounges is 260. Most Saturday nights it is packed to capacity. The beverage lounges are open day and night. 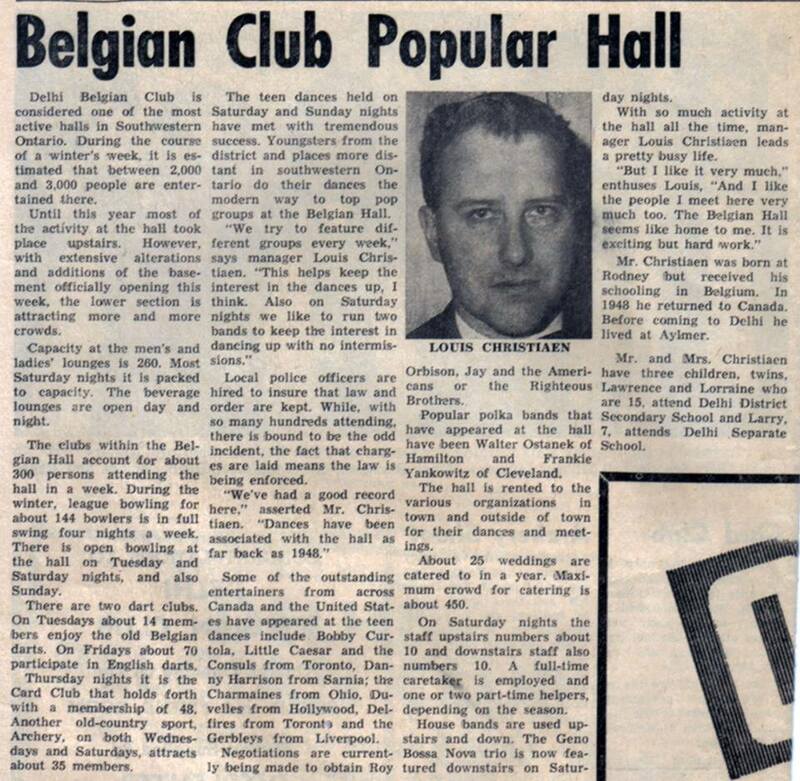 The clubs within the Belgian Hall account for about 300 persons attending the hall in a week. During the winter, league bowling for about 144 bowlers is in full swing four nights a week. There is open bowling at the hall on Tuesday and Saturday nights, and also Sunday. There are two dart clubs. On Tuesdays about 14 members enjoy old Belgian darts. On Fridays about 70 participate in English darts. Thursday nights it is the Card Club that holds forth with a membership of 48. Another old-country sport, Archery, on both Wednesdays and Saturdays, attracts about 35 members. The teen dances held on Saturday and Sunday nights have met with tremendous success. Youngsters from the district and places more distant in southwestern Ontario do their dances the modern way to top pop groups at the Belgian Hall. "We try to feature different groups every week." says manager Louis Christiaen. "This helps keep the interest in the dances up, I think. Also on Saturday nights we like to run two bands to keep the interest in dancing up with no intermissions." Local police officers are hired to insure that law and order are kept. While, with so many hundreds attending, there is bound to be the odd incident, the fact that charges are laid means the law is being enforced. "We've had a good record here," asserted Mr. Christiaen. "Dances have been associated with the hall as far back as 1948." Some of the outstanding entertainers from across Canada and the United States have appeared at the teen dances include Bobby Curtola, Little Caesar and the Consuls from Toronto, Danny Harrison from Sarnia; the Charmaines from Ohio, Duvelles from Hollywood, Delfires from Toronto and the Gerbleys from Liverpool. Negotiations are currently being made to obtain Roy Orbison, Jay and the Americans or the Righteous Brothers. Popular polka bands that have appeared at the hall have been Walter Ostanek of Hamilton and Frankie Yankowitz [sic] of Cleveland. The hall is rented to the various organizations in the town and outside of town for their dances and meetings. About 25 weddings are catered to in a year. Maximum crows for catering is about 450. On Saturday nights the staff upstairs numbers about 10 and downstairs staff also numbers 10. A full-time caretaker is employed and one or two part-time helpers, depending on the season. House bands are used upstairs and down. The Geno Bossa Nova trio is now featured downstairs on Saturday nights. With so much activity at the hall all the time, manager Louis Christiaen leads a pretty busy life. "But I like it very much." enthuses Louis, "And I like the people I meet here very much too. The Belgian Hall seems like home to me. It is exciting but hard work." Mr. Christiaen was born at Rodney but received his schooling in Belgium. In 1948 he returned to Canada. Before coming to Delhi he lived at Aylmer. Mr. and Mrs. Christiaen have three children, twins, Lawrence and Lorraine who are 15, attend Delhi District Secondary School and Larry, 7, attends Delhi Separate School.